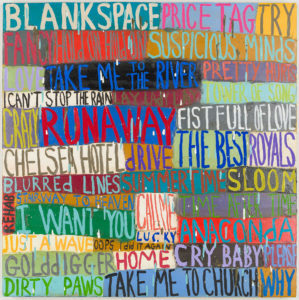 James Harris Gallery | Squeak Carnwath: "Songs"
James Harris Gallery is pleased to present our fifth exhibition by Squeak Carnwath entitled Songs. The artist continues to explore a highly individualized visual language that she derives from the history of art and personal associations, molding a dialogue that is at once static and ever changing. Carnwath’s work has developed over the past 30 years, establishing a distinctive style of painting that is known for its diaristic and pictographic elements to evoke imaginative explorations into the mind. In this show, Carnwath takes an exciting new direction by integrating live sound with a suite of paintings. While iconographic elements of sound have appeared in her work in the past, this marriage of new technology with the grand tradition of paintings suggests a pivotal moment in her career. The works in this exhibition play off our collective and individual responses to language and its representation in relationship to memory. 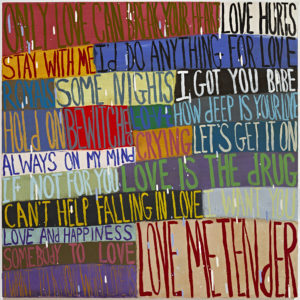 Carnwath often incorporates handwritten text and lists in her work, all done in oil paint. 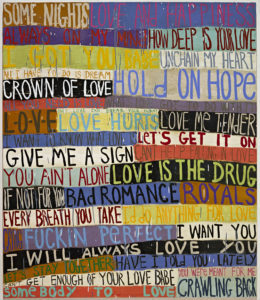 In this series, she has written the titles of love songs across the entire surface of each canvas. They act as triggers with familiar song titles evoking emotions and nostalgia. Each title floats on top of a block of intense colorfields, separating one another from her entire playlist while also unifying the canvas into a richly hued patch work. In a visual and aural sense, the staccato of the words link sight to sound. To intensify this aural connection by going beyond the two dimensionality of painting, an iPod shuffle accompanies each work. In this way the viewer becomes participatory in the artist’s practice. Carnwath continues to employ words, object images, pattern, and stunning color to speak about the body and mind in a metaphysical ablution of paint. As a self-proclaimed “painting chauvinist,” her choice of medium is essential to her process. Painting layers upon layers, she records her own psychological experience on the canvas. The creative vision is not predetermined; Carnwath never has an end goal in mind that might confine or dictate this process of discovery. It is the re-work-ability of oil paint that allows her to realize her intention to create a reality of personal and universal discovery. 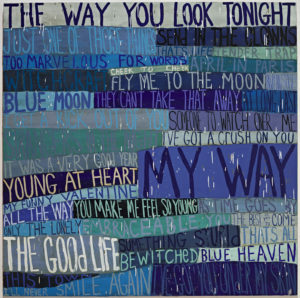 Squeak Carnwath lives and works in Oakland, CA. She is Professor Emerita at the University of California, Berkeley. She has received numerous awards including the Society for the Encouragement of Contemporary Art Award from San Francisco Museum of Modern Art, two Individual Artist Fellowships from the National Endowment for the Arts, a Guggenheim Fellowship and the Award for Individual Artists from the Flintridge Foundation. Her work is in collections throughout the United States.